Libra sun, Scorpio moon, Virgo rising. I’ll be banished for this, but I don’t really know anything about astrology except that Libras are indecisive and care a lot about beauty!!! You could tell me lies about my birth chart and I’d never know, and I’d just mold myself into whatever/whoever to make it work. From my limited knowledge, isn’t that a very Libra thing to do?! Haha. West end of Toronto – a mostly-white neighbourhood. I had a bunkbed with my older sister, and then when she got her own room, my little sister took the bottom bunk and I got to graduate to the top bunk; I got the best of both worlds.5tr444 – oops that was written by Berkeley, my cat! I’m leaving that in. Tell us about where you live right now—or—Describe your usual writing environment—or—Describe the environment(s) in which you wrote How Do I Look? I have a framed Magic Mike XXL poster on the wall next to my computer. I write on my laptop, connected to a monitor that has a bad cable that makes the picture flicker back and forth from my monitor to the laptop like there’s a ghost in the room. My cat sits on my lap a lot, or sometimes directly on my keyboard when he has suggested edits, like in my last answer. Tell us about where you would like to live. A couch, under the shade of a mountain, on a sunny island with my family, friends, good food and wifi, and no mosquitoes. Tell us about one or two of your favourite sensory experiences. I love dim sum and its slippery, rubbery textures. I love the sound that the dinosaurs in Land Before Time make when they walk. Oh, and I love when drivers put the car in reverse and put their arm on the passenger seat as they look back. Why do I think that is so hot?! Tell us about the aesthetic, the -scape, of your writing. How do you think it feels? How do you want it to feel? I think my writing feels like a public diary entry in that it’s very personal and stream-of-consciousness, but also restrained and aware of an outsider looking in. I want my writing to feel like time capsule notes to myself and you (both a specific and a collective “you”) from the past, present, and future, all at once. Who do you consider to be your aesthetic kin and why? What, in your reading or your background, led you to write the way you do write? Where do you think your style of writing came from? Was it a gradual accumulation, out of your character? Or does it have literary antecedents? This is a tricky question! Hmm... I’m still getting to know her work so this might be a big jump, but Sophie Calle just came to mind. I saw 'L’hotel, chambre 25' last summer and am still thinking about her photos and prose vignettes. Her aesthetic is so emotional yet clinical, and you can’t really tell where fiction and reality end or begin, which I admire and aim to do in my writing. My writing style definitely came from my background in screenwriting. I wasn’t very good at it, but it taught me to try and write as visually but also as succinctly as possible. That, and Twitter! AYCE sushi. Not worrying about what other people think. Traveling. Uninterrupted sleeps. Buses/trains/streetcars arriving as I arrive. My cat living forever. Everyone feeling full, inspired, and safe. How does a piece of writing start for you? Hmm, often it starts when I’m supposed to be doing something else. I make a lot of story/poem notes during class (hope my profs don’t read this). Most of my book was written when I was supposed to be writing my thesis at the time. Do you ever suppress anything from entering your writing? I leave out names of people who aren’t celebrities, for a variety of reasons. I think the only one that made it into my book was my friend Sarah who played The Sims with me (hi, Sarah)! Pole dancing! Though it’s not very secret. I started a year ago and can’t stop. It’s the first and only physical activity I’ve done since mandatory gym class in high school (ugh). I bought my first pair of Pleaser heels a few months ago and felt like a baby deer learning to walk and be graceful. What writers/books do you most frequently recommend to people? Eek, where do I begin/end?! I’ll alphabetically list who comes to mind instantly: Franny Choi, Christine Shan Shan Hou, Canisia Lubrin, Claudia Rankine (thanks for the rec and hi again, Sarah! 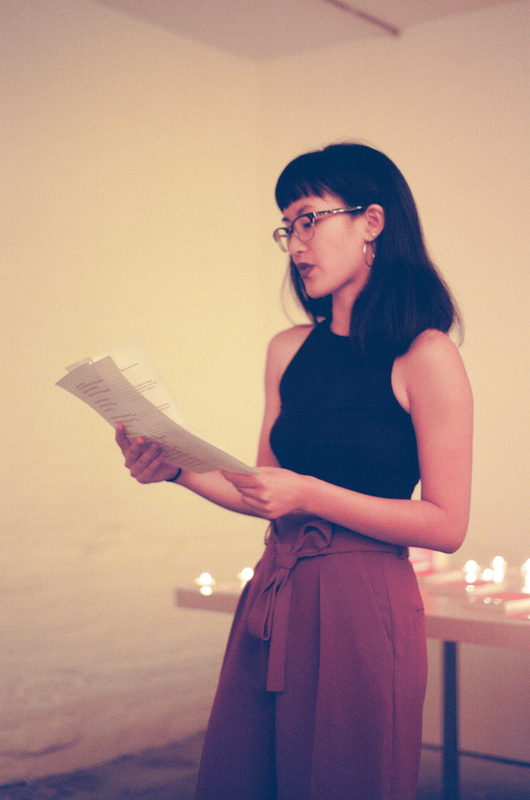 ), Phoebe Wang, Ocean Vuong, A. Zachary, and Jenny Zhang. They’re almost never on my shelf because I’m always lending them! And Metatron’s whole catalogue hehe no joke. which was released by us in the fall of 2018.